Knowledge@Wharton: We’ve seen these changes going on. Where does your concern lie for the future? Martin Ford: It’s really across the board. Traditionally, robots have been in factories, but I think that over the next 10 to 20 years, automation in the form of robots, smart software and machine learning is really going to invade pretty much across the board. It’s going to start impacting jobs at all skill levels. It’s not just going to be about low-wage people who don’t have lots of education. It’s really starting to impact also professional jobs. Knowledge@Wharton: For years, when you did have robots involved, they were viewed as a supplement to the workers, but that clearly isn’t the case now in some areas. From what you’re saying, we’re going to see this even more going forward. Ford: That’s right. 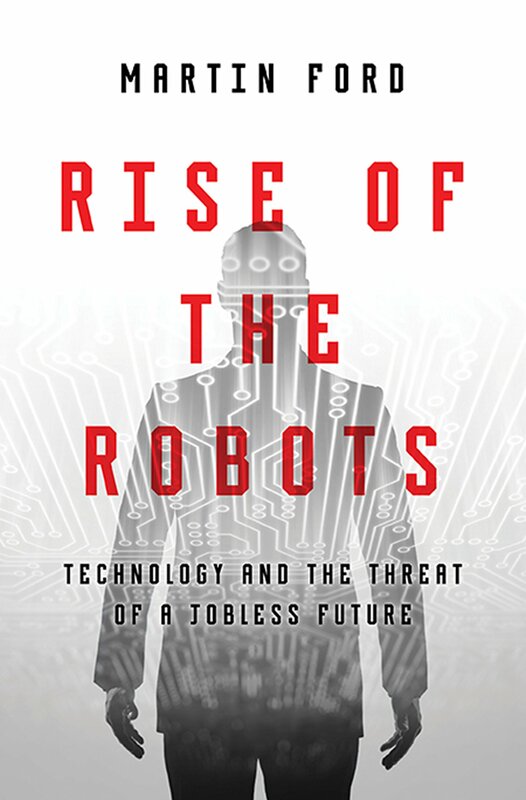 I really think we’re in the midst of a transition where in the past, machines have always been tools that have been used by people and made those people more productive, but increasingly, the technology is really becoming a replacement or a substitute for more and more workers. That’s going to be a huge issue over the coming decade. Knowledge@Wharton: Based on the level of adoption by businesses so far, what has been the effect on the economy? It’s probably somewhat marginal at this point, but it’s certainly going to be growing. Ford: That’s right. Clearly, we have not seen actual massive unemployment as a result of this. That’s obvious. But what we have seen is, for decades now, wages have been stagnant, and even now, as the economy has been recovering and we’ve seen the unemployment rate falling, we haven’t seen anything in terms of wage increases. I do think that technology is probably one of the main forces that’s driving that stagnation of wages. It’s important to note the way that stagnation is happening — even as, over the long run, productivity has continued to increase. We see this decoupling of productivity and wages that really points to this transition that’s unfolding. Knowledge@Wharton: You work in software development, so this is an area that you have focused on professionally for quite some time. How quickly are we going to see this continue to grow? I was watching a segment on a TV show earlier today where they were showing off a driverless pick-up truck. That technology is getting closer and closer to being a part of our everyday life. Ford: That’s right. All of this is subject to a continuing acceleration, and for that reason, it’s going to unfold at a rate that may surprise us. To take the example of driverless cars: It’s just a few years ago — really, back in 2009 — that I wrote my first book on this topic, and I never imagined at that time that driverless cars would be feasible any time soon. It seemed like an almost impossible task, even to me. Yet now, virtually every auto manufacturer, as well as a whole bunch of companies that haven’t traditionally been in the car industry, are working on this, and it’s looking like it’s going to be feasible within 10, 15 years, at least. So it’s pretty amazing how fast things are moving. Knowledge@Wharton: You expect that in a lot of the normal, white-collar jobs, we’re going to see more and more robot adoption and automation come into play. We certainly see it in some respects already. Ford: On Wall Street, most trading is now done by algorithms. There have been lots and lots of jobs that have disappeared already, and again, the important thing is that in many cases, these are skilled jobs. It’s not about the skill level or how much education you have. The primary question is, is the job on some level routine, repetitive and predictable? In other words, can the actions that a worker undertakes in that field be predicted based on what they’ve done in the past? If the answer to that is yes, then it’s going to be susceptible to machine learning, which is really the central technology that’s driving all of this. It’s a huge range of jobs, and it includes a lot of jobs that are good jobs that people need to go to school for. So that really kind of throws a wrench into our conventional thinking about how all of this has worked in the past. Knowledge@Wharton: What are some of the areas that appear to be on the cusp of seeing this great change that you’re talking about and will see greater adoption of robots? Ford: We already see systems that are beginning to impact journalism that can crank out news stories based on data streams. We see the field of law being impacted, with algorithms that do document review taking over a lot of the more routine work that used to be done by lawyers and paralegals. A lot of that is driven by machine learning, and is going to scale across a whole bunch of the knowledge economy. I can imagine that over the next couple of decades anyone who has a job sitting in front of a computer doing something that is some on level routine and predictable — cranking out the same analysis or the same report every month — that type of thing is going to be susceptible to this. That’s an enormous number of white-collar jobs out there. At the same time, there’s going to be a huge impact on many more routine, lower-skill jobs as well — areas like fast food, driving vehicles. So it’s really very, very broad-based. Knowledge@Wharton: It is interesting you mention even fast food. We’ve already started to see places like McDonald’s in some locations put in automation where you don’t have the connection with a person up at the counter to put in your order. You’re just going to put your order in at a menu board, and eventually that food’s going to be prepared by somebody, but it’s going to come out to you without you talking to anybody. Ford: That’s right. There are companies also working on the preparation, what’s happening in the back. There’s a company in San Francisco that’s working on a hamburger robot that can crank out about 400 hamburgers an hour. So you’re eventually going to see automation both in the front, at the counter in terms of the ordering, and also in the back in terms of the food preparation. That again scales to any kind of fast food or beverage — Starbucks, everything. So it’s inevitable that there will be an impact there, and those are jobs that a lot of people rely on. In many cases, people take jobs in fast food because they don’t have better opportunities. Those are a last resort, almost a safety net for workers who don’t have opportunities. Knowledge@Wharton: You mentioned education a little bit ago, obviously, from the aspect of how it plays in to the whole process because of algorithms being such an important piece. But what about the educational system as a business entity? How will it be changed going forward? Ford: We see already the beginnings of that. There’s a lot of focus right now on so-called MOOCs or massive open online courses. There are essentially robotic teaching systems that are becoming more and more powerful, where, for example, a student can use the system online, and there will be a tutor who will monitor their progress and help assign them tasks and adjust the level of difficulty and so forth based on their capabilities. So you’re seeing some pretty important advances there. Right now, education is one of the sectors that has been kind of lagging. If you look at manufacturing vs. education — there have been just tremendous increases in manufacturing. In education, we haven’t seen that, but there are reasons to believe that we may be on the brink of a big disruption. But it’s important to note that if that happens, it’s going to be kind of a double-edged sword. It will make education a lot more accessible, but at the same time, it could impact a lot of jobs in the education sector. Knowledge@Wharton: What about the area of artificial intelligence? Ford: Well, that’s a pretty broad area. What we’re seeing right now are tremendous advances in specialized areas of artificial intelligence: machine learning and a particular area called deep learning, which is based on neural networks. That’s really generating some amazing progress in areas like pattern recognition — systems that can recognize images better than people. Microsoft demonstrated a system that could translate spoken Mandarin into English in real time. Not perfectly, obviously, but the fact that it could do it all was incredible. So we’re really just seeing some amazing advances in specialized areas of artificial intelligence. Knowledge@Wharton: You also bring up the concept of “the Singularity,” and I wanted you to go into that a little bit. It’s something that I think people that are listening to the show would find very interesting. Ford: Right. The Singularity is a future time when, essentially, everything is accelerating so rapidly that it becomes almost incomprehensible. The general thinking is that the thing that’s going to bring that about will be true artificial intelligence. It will be when we build a machine that can think and have cognitive ability at the same level as a human being. Eventually, that machine will turn its efforts to building better versions of itself, and those will become a super-intelligence. Then we’ll have this entirely new phenomenon in the universe — something that’s more intelligent than human beings. That’s what’s going to drive this incredible acceleration. Among the big proponents of the idea of the Singularity are people like Ray Kurzweil who is fairly famous in Silicon Valley. It’s a fascinating concept. There have been some kind of outlandish ideas that, I think, have become attached to it. Many people who believe in the promise of the Singularity also believe that they’re going to live forever because these technologies are going to result in immortality for humans, and that’s fairly controversial. It’s an interesting concept, and there are some elements of it that are useful, but I also think that there’s a lot of kind of crazy baggage that’s attached to it. Knowledge@Wharton: And it’s still a fairly long way off. Ford: Yeah, the most optimistic predictions have it maybe 20 years out, and I would personally guess that if anything like that is going to happen, it’s even further out than that. Knowledge@Wharton: Al is [calling from] Toronto, Canada. Al, welcome to the show. Al: Thank you.… My question is how do you expect automation to affect trade labor and essentially the most common denominator of construction, which is manual labor? Ford: Right. First of all, it’s true that many trade jobs are for the moment relatively safe, because a lot of trade jobs require a combination of visual perception, dexterity, mobility as well as problem solving. Some of the safest jobs are going to be areas like being an electrician or a plumber or maybe a car mechanic because it’s really hard to build a robot that can do all of those things. But over the longer term, that would not necessarily be true, and there are also other technologies that could disrupt those jobs in ways that you might not expect. Speaking specifically of construction, building a robot that can do what a construction worker does is really tough — although people are working on it. But one of the things that could really have a big impact is construction-scale 3D printing, where you build these massive 3D printers that can actually lay down a house or a building. There is some experimentation with that already. So automation can take a completely different form than having a robot do what a person now does. And that may actually be the bigger impact over the longer term. Knowledge@Wharton: There are robots used in the auto industry right now, and obviously, they are not used to the level of being a mechanic. How far of a reach is it to take a robot within the auto industry working on an assembly line, putting the car together, to one that’s able to replace parts in a shop? Ford: That’s going to become increasingly feasible, but it will happen in part because the design of cars will change. In other words, we’ll start to design cars specifically so that they’re very modular and can be perhaps repaired by robots. But if you take your old car from the 1970s, for example, that would be obviously an almost impossible challenge for a robot to repair. Knowledge@Wharton: How much do you see the health care industry advancing in this area in the next 20, 30 years? Ford: Health care across the board is one of the areas where we most want a disruption. The cost of health care, especially as our population gets older, is really becoming just a staggering burden — and that’s especially true in the United States. We still have really a problematic health care system relative to other countries in terms of the cost. I think that it is starting to happen. One of the things you certainly will see is more artificial intelligence leveraged in areas like diagnosis and medicine in general. Some areas of nursing and elder care are beginning to be impacted by robots. That’s being driven, in particular, by Japan, which is doing a lot of research into robotics to help care for the elderly, because they have such a rapidly aging population. So all of that is going to begin to have an impact. Having said that, some areas of health care, like nursing — really going around and interacting with patients and taking care — is really just tremendously hard to automate. I mean, that requires at this point what we would think of as a science-fiction robot. But we are beginning to see progress. Knowledge@Wharton: Given that there are natural areas where it’s very tough to replicate the experience of a human being, we can expect these are areas that are going to continue to be strong employment areas going forward. Are we going to have another shift in terms of what jobs people are going to be really pushed toward over the next couple of decades? Ford: In general, if a college student says to me, “What should I study so that it can be safe?” I think health care is a good bet, if you are doing something that is interacting directly with patients and requires lots of mobility and dexterity … as opposed to, for example, being a radiologist where you’re looking at images and interpreting. That kind of thing can be automated quite easily. But yes, it does foreshadow a shift in terms of where the jobs are going to be. I don’t tend to believe that there will be enough jobs in health care to make up for all of the jobs that are going to be impacted in other areas of the economy. But certainly health care as a particular segment is going to be relatively safe. Who will buy goods and services produced/performed with automation if they don’t have income from jobs with which to buy these things? An economy with automation can’t exist without demand. Where will the demand come from? Robots I believe are there to facilitate and help make tasks easy rather than take up jobs of people. All computers for that matter are robots and one cannot ignore the amount of man hours saved with the advent of the computer age. One such every example is an ATM which eased the bank tellers work so a great extent. There are plenty of such examples in the existing world.